Ask The Protein Powder Chef: Can I Make Protein Cannolis? Who can resist a cannoli? But, before you give in and devour the original, consider putting a new spin on Sicilian pastry dessert with this diet-friendly alternative. Hi Protein Chef! Cannolis are my all-time favorite treat, and I'd love to be able to include them in my diet without feeling guilty afterward. Is there a healthier version? Cannoli, yum! Indulging once in a while is fine, but too many of those crispy shells and creamy-cheese centers can fry your diet quickly. Don't fret, however. I'm a sucker for a challenge, so I decided to take these on and remake them as healthy protein concoctions. 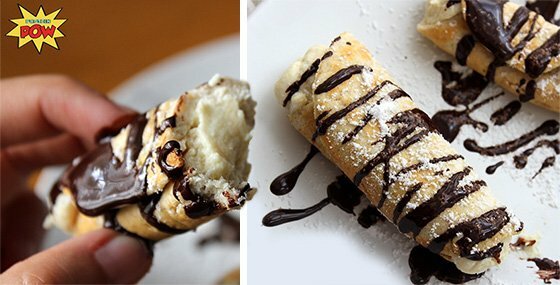 First, I formed each cannoli shell by making a thick-ish protein pancake, frying it into shape with some low-calorie spray, and stuffing it with protein frosting before adding some melted chocolate and powdered Stevia for effect—you know, that irresistible, gotta-have-it, fresh-from-the-oven effect. The trick is the "frying it into shape" part. Normally, cannolis are made using cannoli molds—thick, short tubes you wrap pancakes around as you fry them to ensure they retain a tubular shape. They're not expensive, and you can easily get them online. No cannoli molds? No problem. Just get a little inventive. While it's a bit trickier, you can use a fat raw cannelloni instead (which would be very apropos given that cannoli are related to cannelloni) or another thick tubular object.